65 delicious, easy-to-prepare ketogenic recipes for vegetarians, who can now enjoy the benefits of the diet that is taking the world by storm Who says vegetarians can't go keto? The most talked-about diet in the world is now reaching a whole new audience with THE ESSENTIAL VEGETARIAN KETO COOKBOOK. Featuring 65 low-carbohydrate, high-fat, moderate-protein, vegetarian (and pescatarian) recipes, readers who assumed ketogenic eating was off-limits for their lifestyle can now prepare easy, delicious, keto-compliant meals. Try coconut-almond chia pudding, pumpkin pie pancakes, roasted cauliflower-turmeric soup, and easy, filling keto-fied salads. Including 40 photos, an overview of the ketogenic diet and its main health benefits, and tips on how to meet and track macros, this cookbook includes everything vegetarians need to know to prepare keto-friendly recipes, without any of the overwhelming extras. 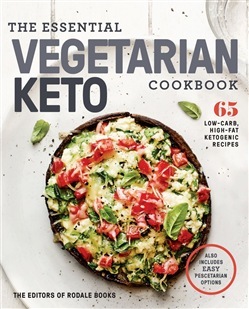 Acquista The Essential Vegetarian Keto Cookbook in Epub: dopo aver letto l’ebook The Essential Vegetarian Keto Cookbook di Editors of Rodale Books ti invitiamo a lasciarci una Recensione qui sotto: sarà utile agli utenti che non abbiano ancora letto questo libro e che vogliano avere delle opinioni altrui. L’opinione su di un libro è molto soggettiva e per questo leggere eventuali recensioni negative non ci dovrà frenare dall’acquisto, anzi dovrà spingerci ad acquistare il libro in fretta per poter dire la nostra ed eventualmente smentire quanto commentato da altri, contribuendo ad arricchire più possibile i commenti e dare sempre più spunti di confronto al pubblico online.